Welcome to my Danger Den CPX-Pro pump review. I would like to give special thanks to Jeremy from Danger Den for yet another great product to review. Danger Den has given me the opportunity to try out many of their great products, and it's always a pleasure trying out all the latest and greatest water cooling performance products that have such a strong emphasis in high flow and high performance. 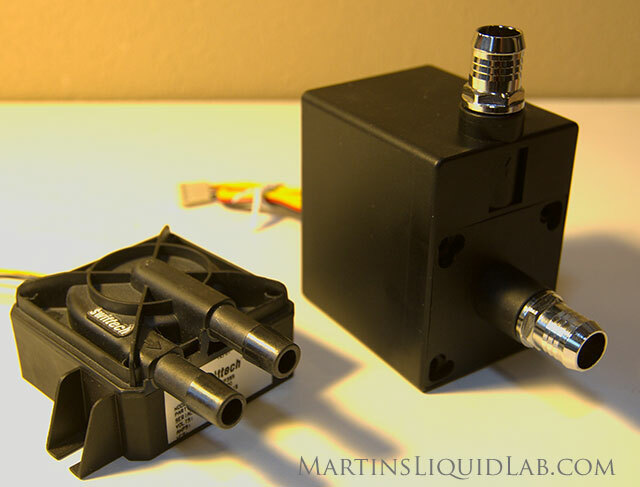 They also carry a large array of other manufacturer's products to provide you with a complete solution in water cooling. 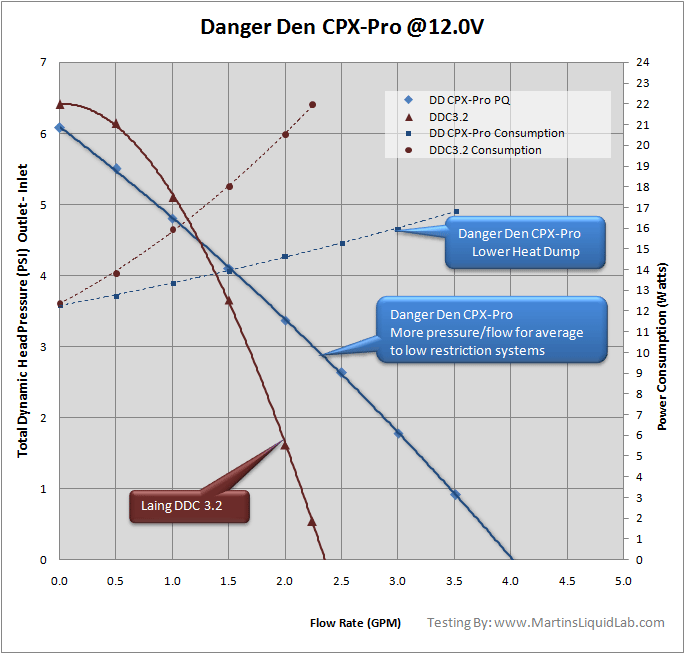 With this review I will focus on all performance characteristics of the Danger Den CPX-Pro pump. First off you may be curious what this pump is. It is a new pump that most folks are not aware of.. You can think of this pump as the CPX-1's bigger and stronger brother, because that's exactly what it is the next step up from the CPX-1. For scale lest take a look at the pump next to the popular Laing DDC 3.2 (MCP 355), as you can see it is a fair amount larger. Actual Measurements Barbs included 4.02"(103mm) length x 4.02"(103mm) height x 2.08" (54mm) width. G1/4 Barbs with Danger Den Fatboy HighFlow barbs, my current favorite barb! Note the spiral shaped volute, very nice!! Upon opening the pump, I was pleasantly surprised to see the volute is a true spiral shape, that's the most efficient shape for centrifugal pumps, and this should translate to high efficiency and lower heat dump. Also if you take a close look at the photo below, you'll see the impeller shaft is actually ceramic and not steel, this will also ensure a long high efficiency life of the mating surface between the impeller blades and the shaft. 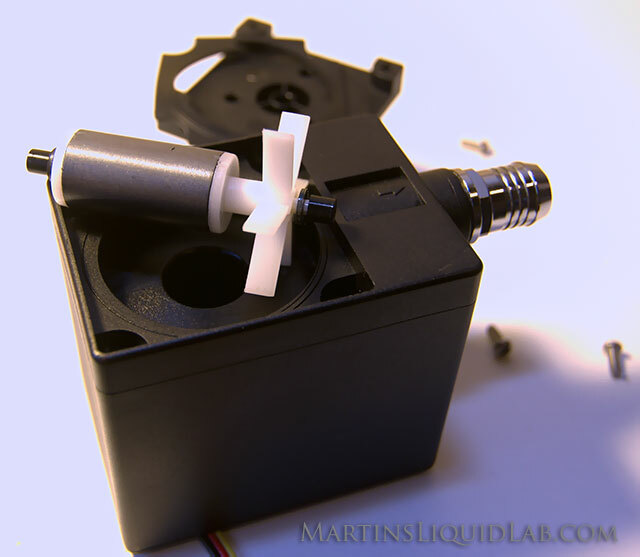 The Alphacool AP1510 pump I reviewed used a stainless steel shaft, and the DDC, D5, and Iwaki RD-30 all use higher quality ceramic for their bearings or shafts. Also rather than an o-ring, the CPX-Pro uses a rubber gasket that covers the pump top surface which you can see in the photo above and in the background below. The most scientific way to determine a pumps performance is to plot the entire pump pressure vs flow rate curve. This can be done by measuring pressure at the inlet and the outlet of the pump with a digital manometer and using a gate valve immediately after this pressure measurement point. This method of capturing both the inlet and outlet pressure then gives you the "Totat Dynamic Head" in pressure in (PSI) . 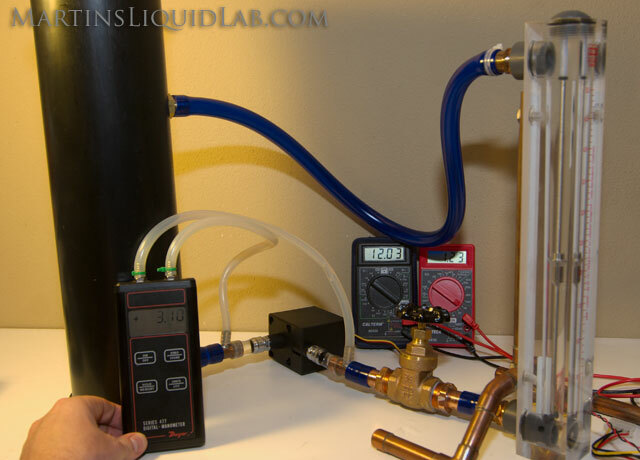 This method is consistent with the recommendations by gouldspumps.com pump field testing technical article for field testing and I believe more accurately captures the entire power provided by a pump and will provide more accurate curves for estimating flow rates. Then utilizing this gate valve, adjusting the amount of restriction will net different flow rates and coinciding pressures the pump is producing over its curve. All of this is preferably done at a very precise 12.00V or the tested voltage as needed. While testing for pressure and flow rates, data was also collected using multi-meters to capture voltage and current in amps for power consumption data. You'll see the pressure axis is labeled as "Total Dynamic Head Pressure which is equal to the "Discharge Pressure" - "Suction Pressure". You can think of this as the reverse of pressure drop, it is "Pressure Gain" from the pump. I believe most manufacturer pump curves follow this same testing method for developing pressure. It's actually more common to refer to "Head" rather than pressure, but in water cooling we're always dealing with water, so I've had the habit of just reading in PSI and leaving it at that, so it's consistent in units with pressure drop in PSI. Water Source - Household water pressure - 50PSI at >5GPM - Because flow rate readings are instantaneous, household tap water and water pressure are a good and powerful source for pressure drop testing. Samlex PSA-305 Variable DC Power Supply - Adjusted voltage to be at 12.00V +-.03V. The pump performs very well, and to put it into better perspective here is a comparison of the pump curve in relation to the stock DDC 3.2. The pump performs very well compared to the stock DDC 3.2. 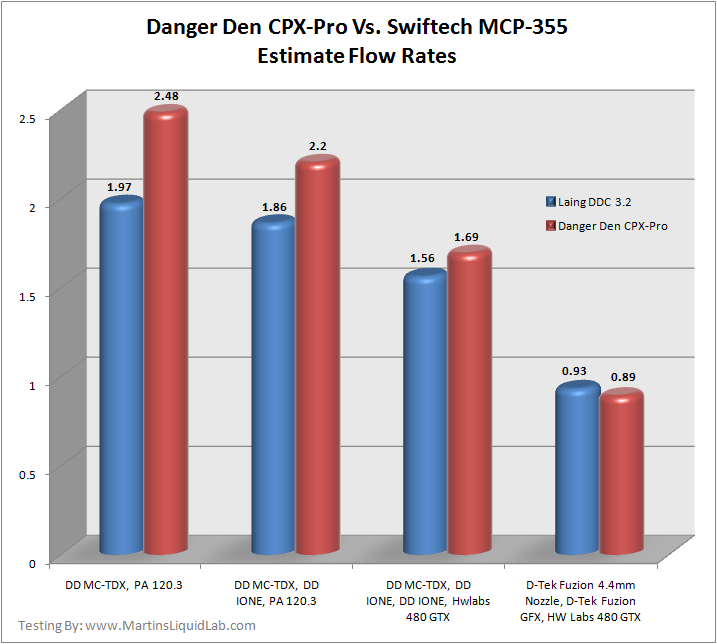 An average to low restriction system would typically see higher flow rates with the CPX-Pro, and really high restriction systems would see very slightly more performance from the DDC. The important part that catches my attention is the power consumption. 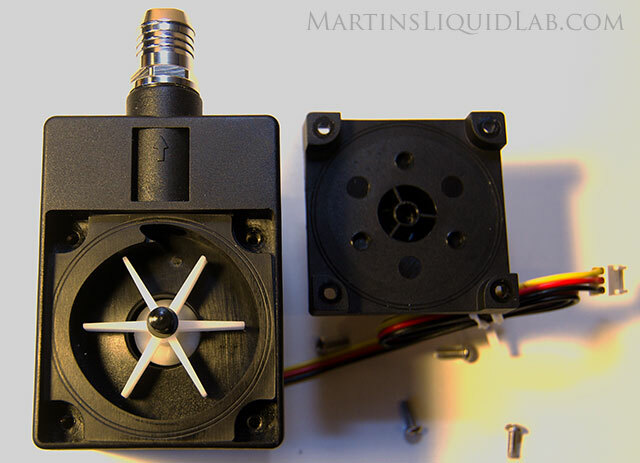 At the 2 GPM mark, the DDC is consuming nearly 21 watts, where then DD CPX-Pro is only consuming about 15 watts, so the DDC at that point is consuming about 40% more power which in the end becomes added heat to the loop. To help put performance levels into context, I've selected a range of components for several setups. Generally anything over 1 GPM is adequate flow rate and more is better although gains are generally small past 1 GPM and even smaller past 1.5 GPM. Sound level is a fairly tricky thing to quantify. For one, ambient noise level affects decibel level, and second decibel level alone doesn't give you a sense of the type of sound (Some noises at the same volume are more annoying than others). I've chosen to record the sound level with my Mastech multimeter/sound level meter and record the sound using my stereo capable JVC GZ-MC500U digital video camera. This way you can get a sense of the type of sound as well as the level. I typically wait until late at night when the house is completely silent and run my sound level testing which I did in this case as well. So the pump added noise level fits in to the "Barely Perceptible Change" noise level, the lowest I've recorded yet, very nice! I'm really impressed with this pump for several reasons. The smaller sibling (CPX-1) has a strong reputation for being one of the quietest pumps around, and it's nice to see this larger and more powerfull big brother pump follow suit. It's very similar in pumping power to that of the Laing DDC 3.2, but it does so with less power consumption/heat dump and it also already comes with G1/4 barbs. The DDCs and D5 are also excellent pumps, and now we have another one to choose from with similar excellent performance. 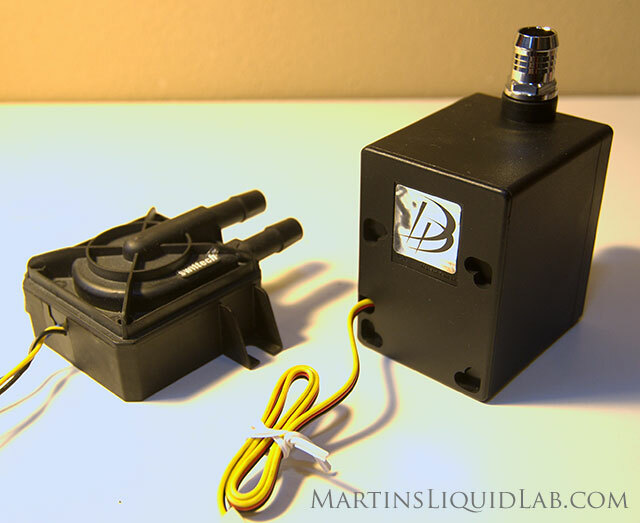 This is an excellent all around pump for most water cooling systems. Danger Den tells me this pump will retail for around $54.95, so it's at an extremely competetive price point and would cost less than both the Laing D5 and the Laing DDC 3.2. Good news for us! !